From Jamestown, North Dakota, Lady Blue, Jan , and I head east on Interstate 94 towards Fargo. Once through Fargo and into Minnesota, we exit north on Route 336 for a short connector to Route 10. 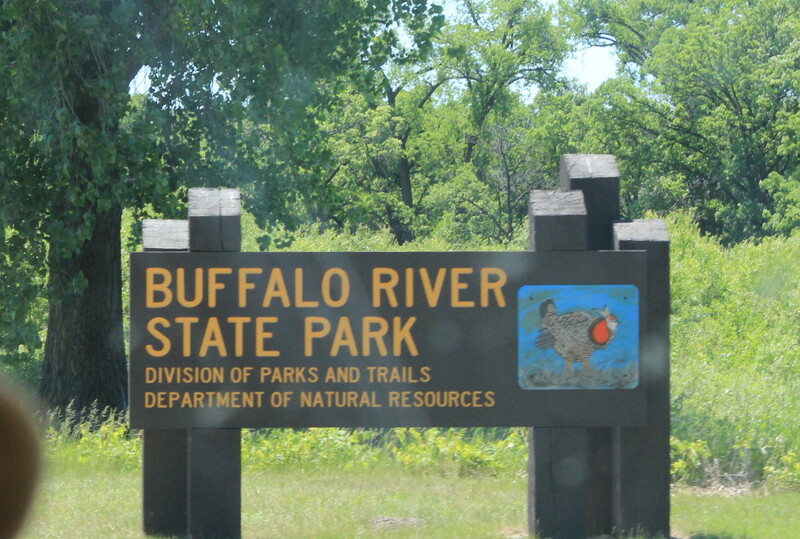 Just a short distance away is Buffalo River State Park. The sites are well separated. We choose to dry camp. Quieter. Leaving Buffalo River, we still follow Route 10 east. 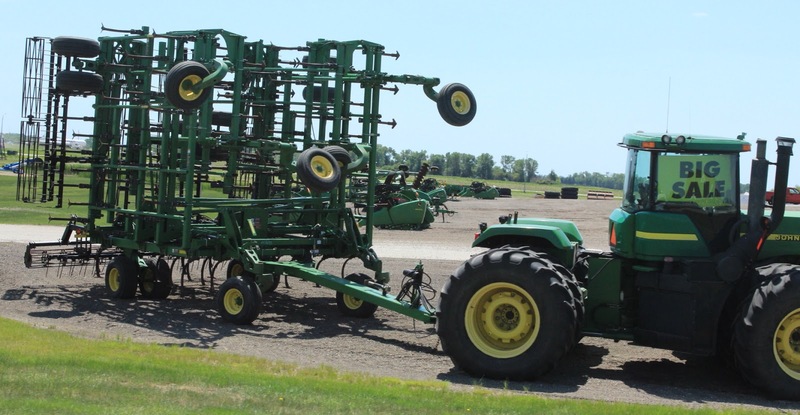 We have seen many Deere sales in the Midwest. However, these are not your lawnmowers. How does it unfold? A little hard to see, but in the front you can see a 6 step ladder used to get into the cab. And yes, you can walk under the unit between the tires. 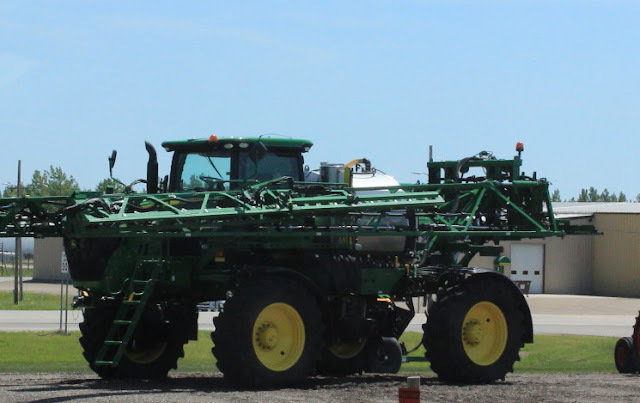 This looks like a giant plant sprayer. If you haven't seen a John Deere website lately check this website. One of the biggest machines we have ever seen along the road is a sugar cane harvester, seen in southern Florida. Around Motley we leave Route 10 for Route 210 east to Brainerd where we can pick up our mail. We have had some problems with our mail recently. Not the Escapee mail system( from our RV membership mailers out of Texas.). However, we discovered that if you do not address a general delivery package to just "general delivery" plus a zip code it will be returned. That happened with a sneaker order. We gave the street address of the post office and it was rejected by , evidently, another office within the post office building, even though it clearly said "general delivery". In this case, for Brainerd, an order from LL Bean went astray to Maine instead of Minnesota because the online order first confirmed the Minnesota address and then rejected that for an older address in our shipping history. Note to selves---erase old addresses. Did you notice the shape of the park sign? How about the Indian influenced design of the eagle and fish? Postal difficulties are small in the order of things and they are quickly corrected. We learn not to worry too much. 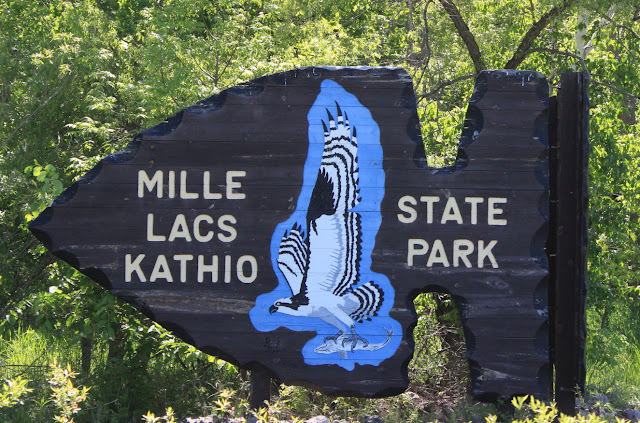 We follow Route 18 out of Brainerd to Garrison and down the west side of Mille Lacs Lake to Kathio State Park. 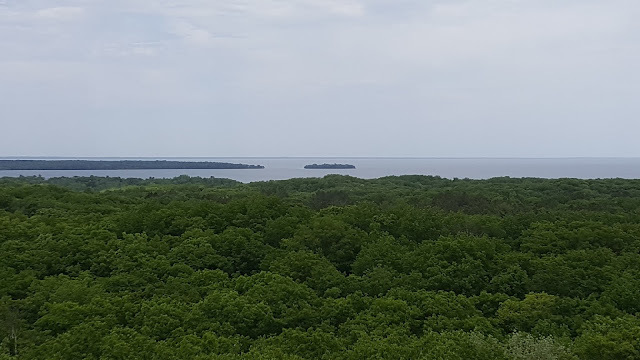 Above is a view from the observation tower. 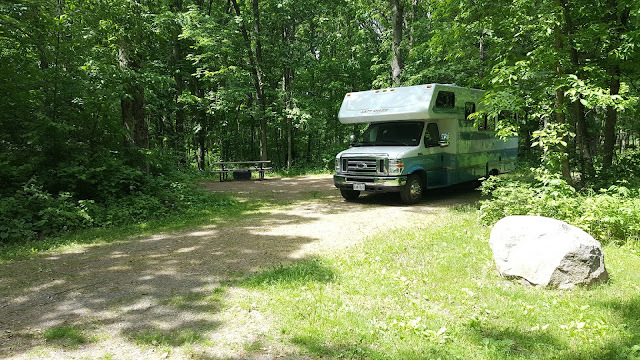 This is a huge state park. It is a two plus miles drive just from the office to our campground. We easily did 5 or 6 miles on bicycle while here just from our site to the office and the lookout tower and back. 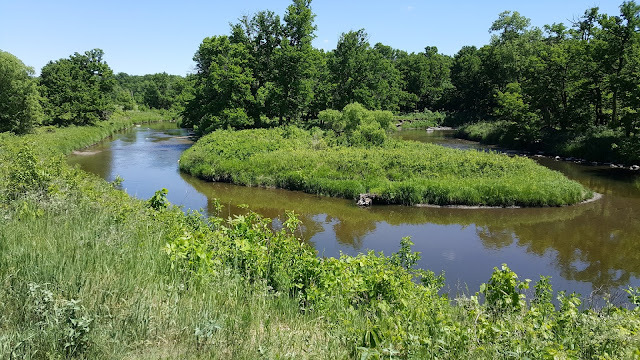 Minnesota, the" land of 10,000 lakes" actually has 11,842 lakes of 10 acres or more. Mille Lacs is the second largest lake in the state and is a fishing center with many tournaments all year. 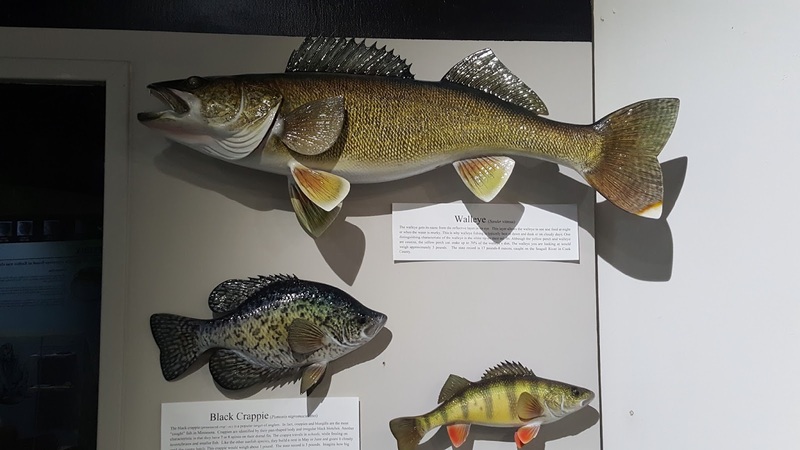 The Walleye above can reach 17 pounds 8 ounces. Compare to the yellow perch at the bottom. That's a lot of earthworms. Or poles plus a good Bass boat and motor. The top fish is a Muskellunge or Muskie with a record weight of 54 pounds. 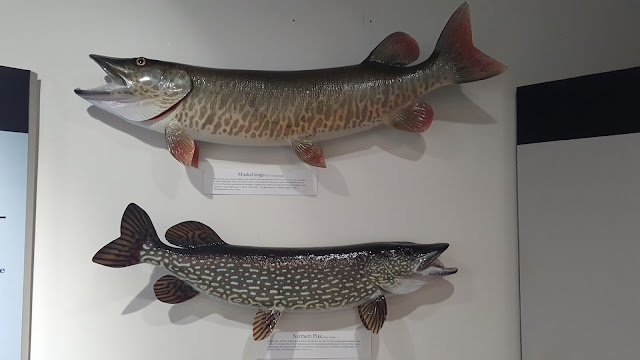 The lower fish is a Northern Pike with a record catch of 45 pounds, 12 ounces. Leaving the park, we head east and north around the lake. Note: The town of Isle has one of the best bakeries ever. 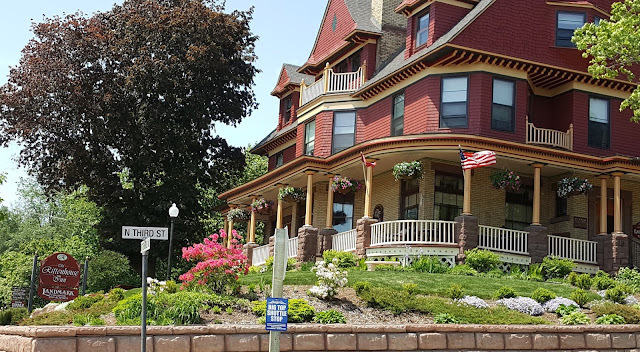 Jan and I notice some beautiful homes on the east side. 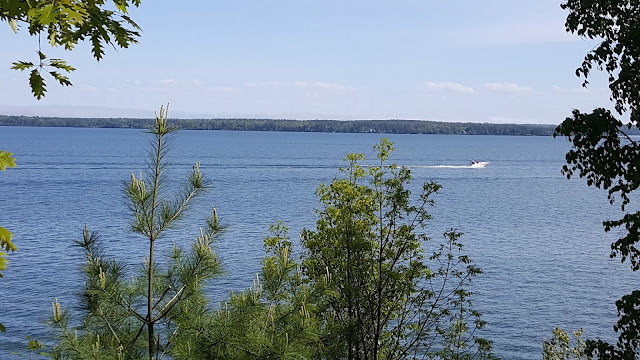 All with great lake views, but mostly very modest homes. Once at the top of the lake, we take Route 169 north to Route 210 east again. 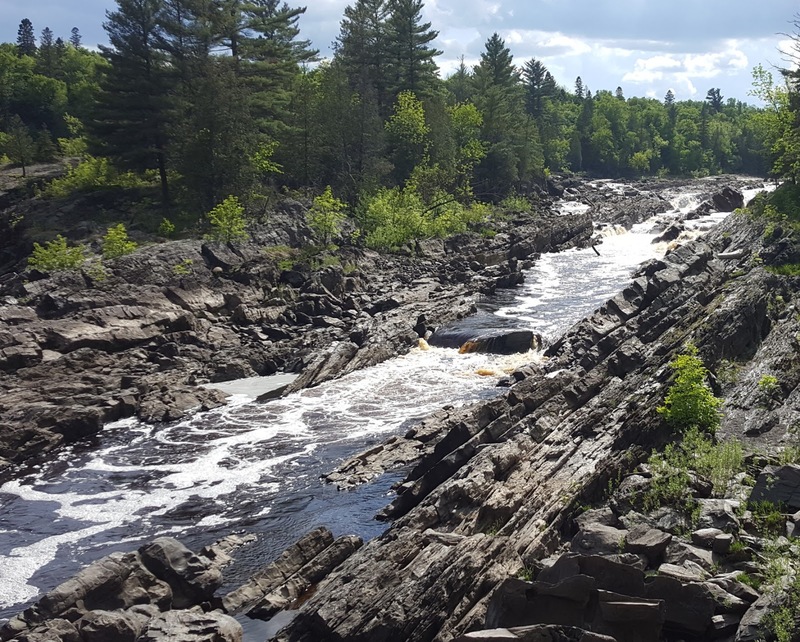 This time, we are heading to Jay Cooke State Park which is about 20 miles south of Duluth, Minnesota. 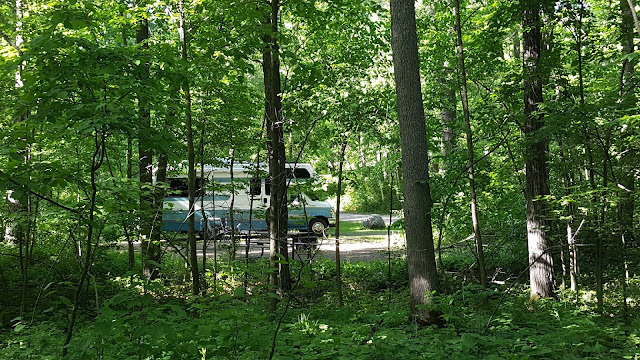 This park is on the St. Louis River. The bridge is the latest version of a bridge across the river and the rock formations. Hard to believe looking at this, but in 2012, after 8 plus inches of rain in 24 hours, the last bridge---same height--was destroyed. 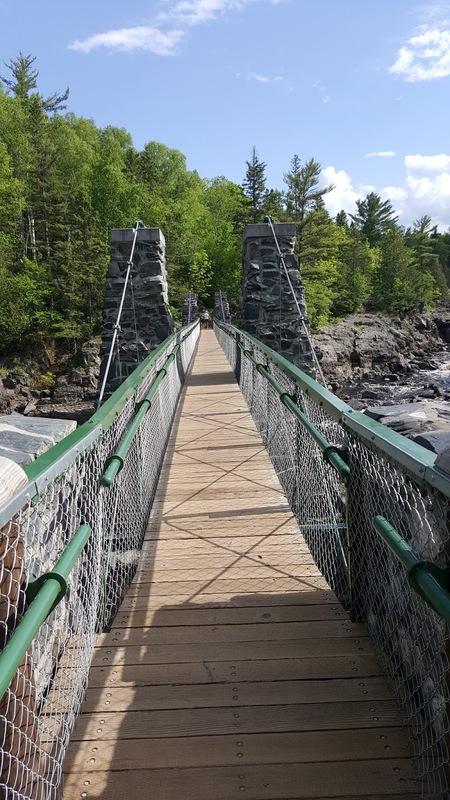 Also known as the swinging bridge. A good example for budding geologists. Millions of years after a seabed disappears, the sandstone turns to rock and a lifting of the crust creates the vertical slabs. 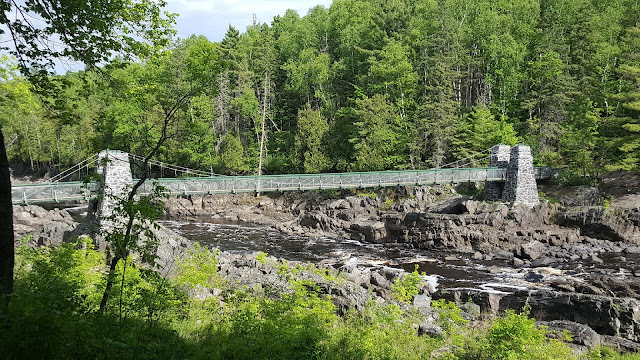 From Jay Cooke, we head north towards Duluth on Interstate 35. 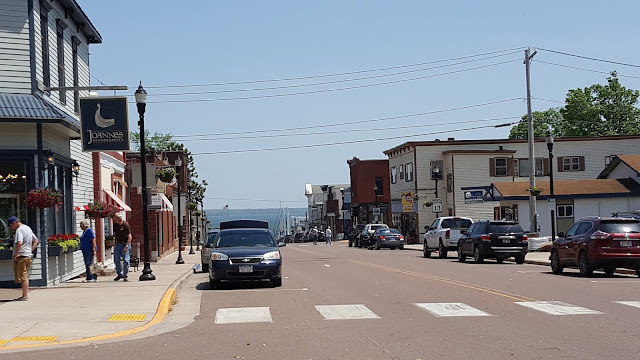 Duluth, Minnesota and neighbor Superior, Minnesota are the furthest western end of the Great Lakes St.Lawrence Seaway. Route 35 to the exit for Route 53 and Route 2 east. 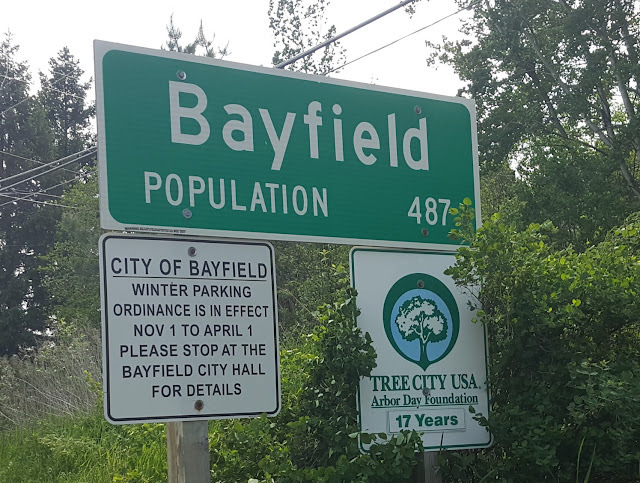 A short bit of travel and we are through Superior and ready to exit onto Route 13 north towards the Apostle Islands and Bayfield, Wisconsin. 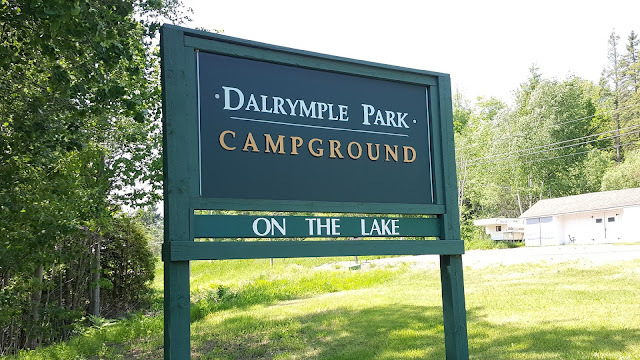 After a quick stop at the Visitors Center for the Apostle Islands National Lakeshore, Jan and I head about 1 mile out of town to Dalrymple City Park. Beautiful views of Lake Superior from the campground. We could have taken a ferry boat to Madeline Island and a state park campground on the island. 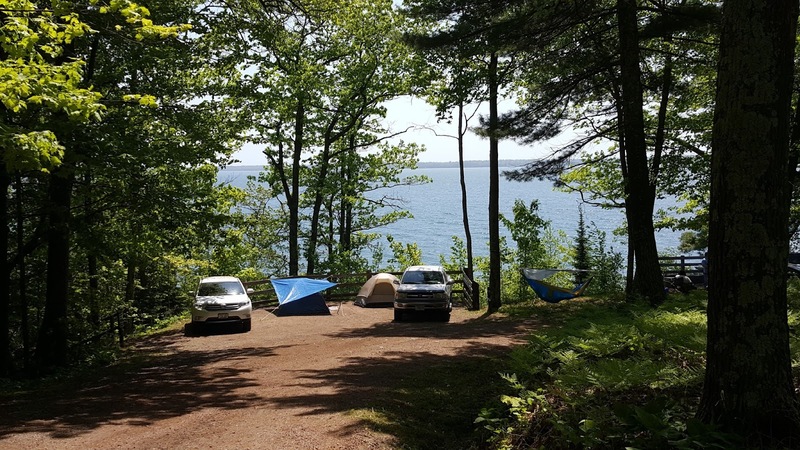 But , the ferry cost would have been about $108 for a round trip plus camping fees. For a short stay that didn't seem to fit. 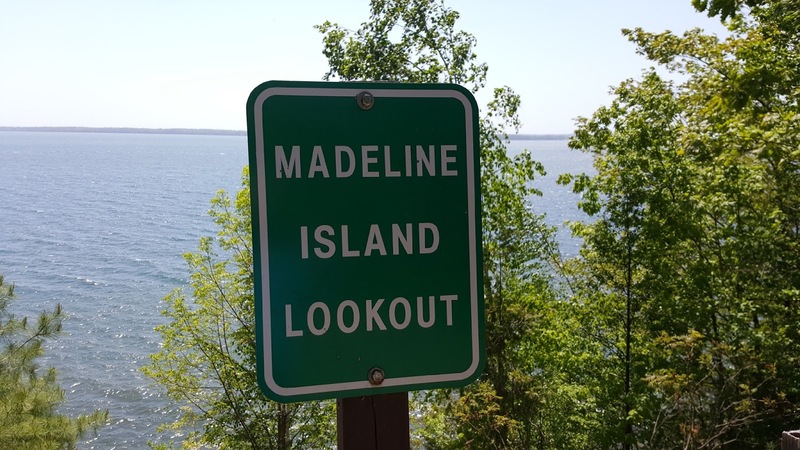 It is quite easy to take a the boat over to Madeline Island, but there are a total of 22 islands that offer hiking, fishing, caves, and more. Some of the sites here offer better views than those found at the state park campground( we are told). Bayfield is a small town that reminds us a lot of Camden , Maine. 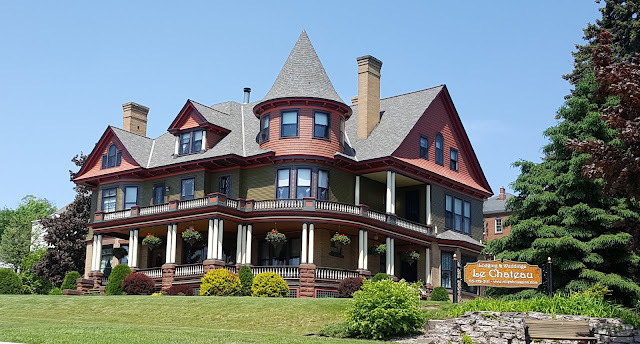 Some homes have been renovated to great Inns like this one, Le Chateau. It is one of two listed under Rittenhouse Inn. 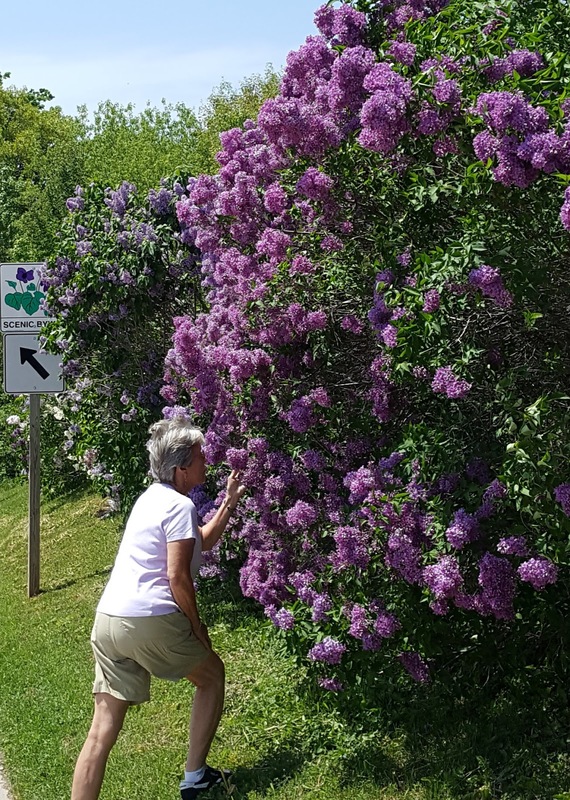 It seemed that all of the properties in Bayfield had a number of lilac bushes of various colors. And they were all in full bloom well over a week into June. This is the other Rittenhouse Inn. This one seems to be the main Rittenhouse and the earlier pictured house is known as Le Chateau. The colors, the porch, the balconies, and more are very impressive. Also impressive is their website. 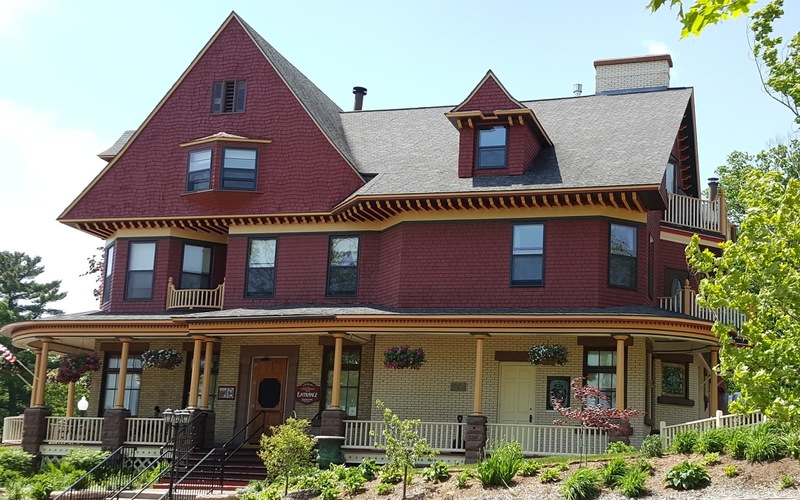 "lodging", "offers", "restaurant", and "weddings"
You can click on each listing and see pictures of each room, etc. 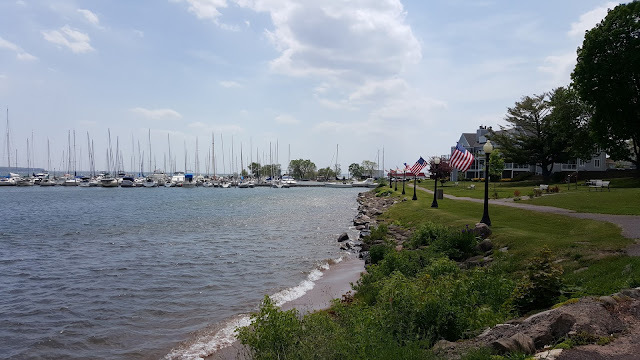 A very small town, but the main street gives views of the lake. The store on the left, Joanne's was a classy store offering Scandanavian merchandise. The ferry can carry cars and RVs over to the island. These kayakers are taking lessons close to shore. High winds made venturing out not very safe. 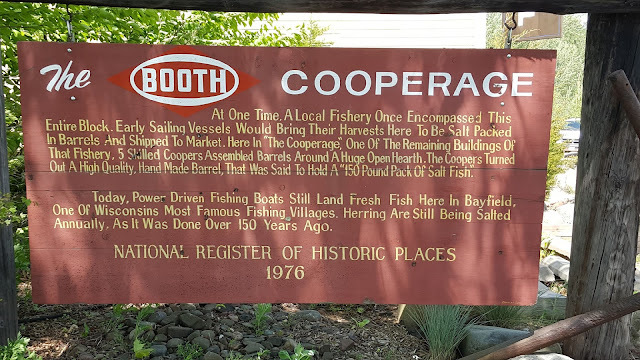 Some of the history of the harbor . 5 skilled coopers working to build barrels to ship salted fish. This section of the harbor bears a resemblance to a smaller Bar Harbor, Maine. The walkway is very similar heading over to the marina. We have to keep reminding ourselves that this is a fresh water lake. It is the largest fresh water lake in the world. 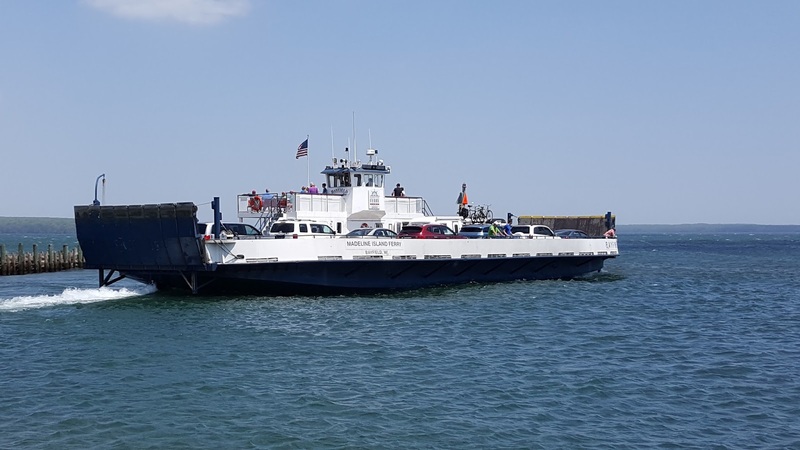 No wonder the Coast Guard needs this special boat with a solid see through cabin and two 225 horsepower motors. The info in this town reminds people that the lake is the boss, no matter what size your boat or how good you think you are. 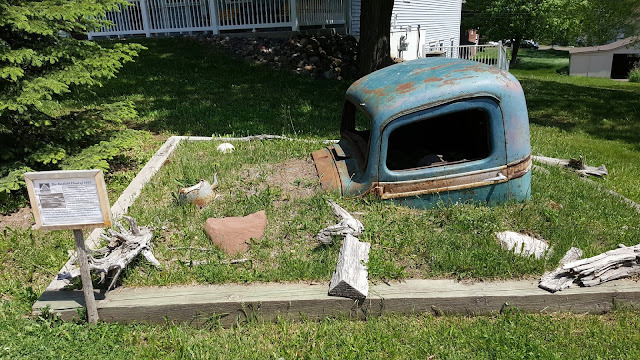 An eyecatcher on the lawn of one of the museums in town. This brings attention to 1942 when a massive flood buried cars in up to 4 feet of sand. Of course, the whole story can be found inside the museum.